Crockett is a small town nestled under the C&H Sugar Factory on the Carquinez Straits in the northernmost point of Contra Costa County. 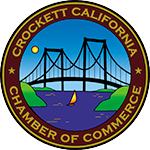 Crockett Businesses and stores will be out and about welcoming shoppers, pickers & vintage thrifters who flock to one of the longest running Town Wide Sales in the Bay Area. NO CHECKS day of sale. Clean-up deposit to be returned at time of check-out. All checks payable to: Crockett Chamber of Commerce, PO BOX 191, Crockett, 94525. Payment is due at time of signup. If spaces are available on day of sale, they will be sold cash only payments required. Cancellation: The cancellation deadline is May 1, 2018 at 3:00 PM for reimbursement. Chamber office line 510-787-1155. Electricity: No electricity is available to stalls. No generators are allowed. Tables & Chairs: Vendors will supply their own tables, chairs, tarps, umbrellas. All merchandise is to be displayed in a neat and orderly fashion. Pets: No pets are allowed in the park day of event.